Mallorca is infused with millennia of history, culture and cuisine – and there is a whole generation of top world chefs whose connections with the island have brought them back to explore Mallorca's culinary heritage, presenting their take on the island's recipes through a glittering cavalcade of restaurants. Here's our pick of the crop – and by the way, the star ratings below refer to Michelin stars! 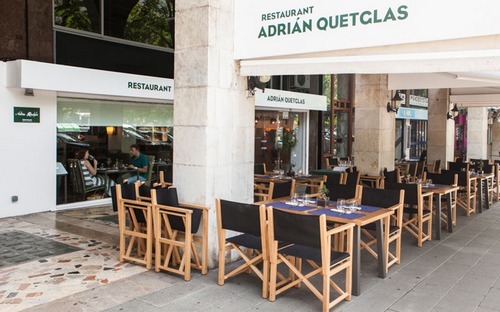 See our places to eat in Mallorca below. 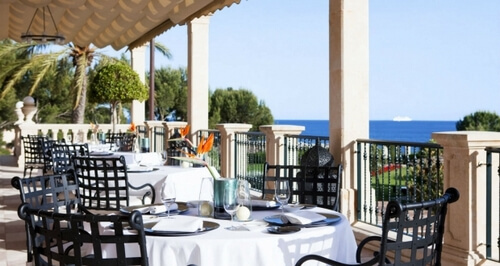 A shining star in Mallorca's restaurant firmament, Zaranda is one of the island's top eateries, and is located in the magnificent Hotel Castell Son Claret. Awarded a Michelin star in 2014, Zaranda owes its outstanding reputation to brilliant head chef Fernando Perez Arellano and his hard-working team of truly inspired cuisine experts. 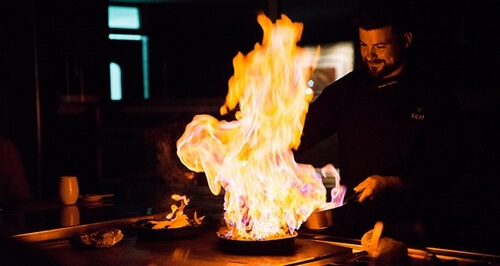 Fernando and the fifteen-strong team pride themselves on creating magnificent dishes based on traditional Mallorcan dishes and the very best of the island's produce – plus the wine cellar is artfully stocked with over 270 of the finest wines from Mallorca and beyond. Award-winning Fernando loves to create dazzlingly original dishes such as Burrata Zaranda – creamed goats' cheeses, strawberries and basil coulis; glazed veal pavé , with leeks and potato salad; and the truly remarkable ‘black egg' which is exactly as its name implies, and with a magnificent taste that is quite beyond description! Named after its owner and head chef, Adrian Quetglas, this fabulous restaurant – and its food - reflects the exotic nature of its owner and his life story. Born in Buenos Aires with Majorcan blood and family, he has worked all over the world – including ten years in Moscow. Finally, he returned to Mallorca to explore his Mediterranean roots, and to explore the cuisine of his island, combining it with the influences that he has absorbed on his worldwide journeys. The menus effortlessly combine the eloquent simplicity of the best in Mallorcan fruit and vegetables, meat and fish with innovative and original cooking techniques – resulting in menus that are stunningly original, witty, amusing and entertaining. The five-course lunches are highly recommended, and the seven-course evening meals are a stellar journey into stratospheric food preparation and presentation. This restaurant is truly wedded to the land, contributing to its richness with careful husbandry, and enjoying the fruits of labour to raise fresh produce from an estate of 6,000 square metres. A mass of fruit and vegetable, herbs and speciality foods are grown here, harvested and brought straight to the kitchen for immediate preparation, cooking and serving. Add fine Mallorcan meat and fish, traditional recipes given modern reinvention, and you have a truly unique restaurant that's well worth a visit. In a protected and lovely area of the island, the restaurant excels itself in creating tasting menus that are never over-facing and never less than a delight of inventiveness originality and superb kitchen artistry. Wines are carefully recommended to match individual courses, and desserts plus local cheeses are an especial pleasure. 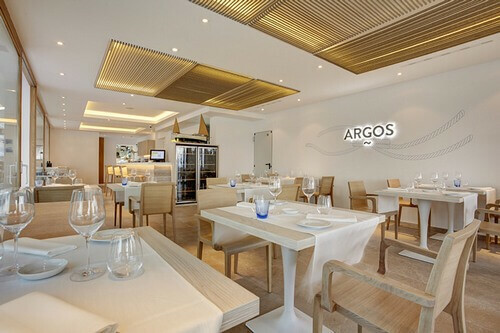 Located in the delightful boutique hotel La Goleta (for grown-ups only), Argos matches its surroundings with a superb offering of fine dining in a fabulously fashionable and embracing atmosphere of cool minimalism, hip décor and understated luxury. With floor-to-ceiling windows, natural light floods in, blurring the distinctions between indoors and outdoors, especially with those to-die-for views out to sea and across the bay. The kitchen team is commanded by inspirational chef Álvaro Salazar, a finalist in the San Pellegrino Young Chef (Spain & Portugal) competition – and he specialises in original Mediterranean cuisine using locally sourced produce. The à la carte menu is admirably restrained, the set dinner is wide-ranging, and the tasting menus (with optional wine pairing) are a gourmet adventure. Quite deservedly, Argos was awarded a Michelin star in 2017. 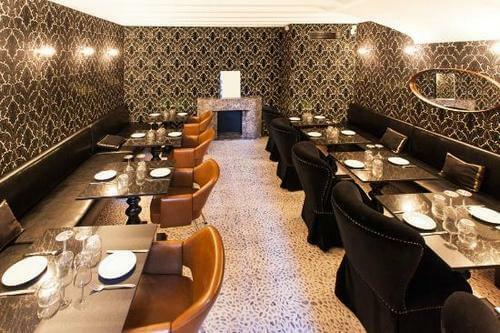 Some restaurants seem to exude effortless style, and this is one of the island's most fashionable, friendly and professional, all wrapped up in a level of super-smooth customer service that belies the incredibly hard work that goes on to bring you exceptional food, combined with exquisitely chosen world-class wines. The team leader is the entirely splendid Tomeu Caldentey, one of Mallorca's truly artistic chefs – a creative mastermind who brings out the best in his colleagues, and does miraculous things with the produce that he careful gather from all over the island. Seafood dishes are superb, the meats are seasoned to perfection, and the choice of desserts is never less than dazzling. A Michelin star is a hard-won award that demands dedication, inspiration, innovation – and sheer hard work. Es Fum's Michelin Star is entirely reflective of the dedication and brilliance of its staff, and the food here is truly in a class of its own. Add a lovely outdoor terrace, views of the Mediterranean Sea, and balmy breezes that ensure just the right temperature, night and day, and you have a recipe for restaurant perfection. The menus are outstandingly original and daring, featuring dishes such as Cantabrian lobster with pickled vegetables and coconut; Gillardeau oyster in a Bloody Mary sauce, Rib-Eye carpaccio with a ginger emulsion, and truffled egg yolks with bacon. The artistry of this restaurant is also reflected in the presentation, from the dishes themselves (each one a work of art) to the superb place-settings, décor and artworks. A must-visit for those who appreciate the ultimate expression of gourmet superlatives! 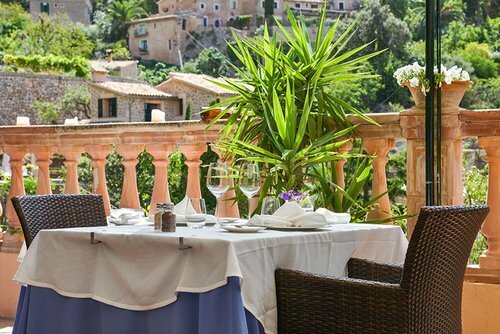 When you visit Deia, on the northern side of Mallorca, you're in another world; dramatic rocky scenery of mountains and coastline make this a magical area – and one of its most attractive, upmarket and desirable villages is Deia. One of the star restaurants in this warm and friendly community is Es Raco d'es Teix, a family-run restaurant for over 20 years, and well established as one of the most alluring eateries on the island. Chef Josef Sauerschell is a Michelin star winner, and the evidence of his genius is crystal-clear when you peruse the dazzling menu at this charming, low-key venue, with its lovely terrace views of the mountains. The tasting menu is a formidable display of culinary artistry - and being so close to the sea, you can be assured that fresh seafood always features high on the menu. Dani and Maca de Castro are the powerhouse partnership behind this fabulous restaurant in Puerto Alcudia, and together they create dishes that infuse the elements of Mallorcan tradition with the island's wonderful fresh produce, adding their own creative take on traditional recipes. The result is a creative celebration of the joys of eating, aided by friendly, superbly well-trained staff, a wine cellar that must be considered to be one of the finest on the island - and that extra magic ingredient of being welcomed, on your arrival, both as an honoured guest and as a familiar friend. Brother and sister team Dani and Maca are both steeped in culinary experience and have a lifetime of knowledge of Mallorca's distinguished and varied cuisine. 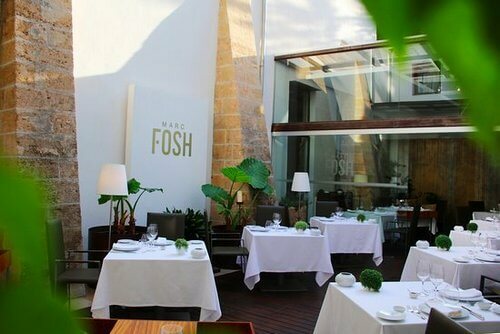 Ideally located in the heart of Palma, Mallorca's capital, Restaurant Marc Fosh is a Michelin-starred restaurant of considerable charm, devoted to high-level gastronomy. Based on Mediterranean cuisine that uses seasonal ingredients to create clean, crisp flavours, dishes are both artful and thoughtful in their composition. Named after the restaurant's charismatic award-winning owner and chef, the restaurant is situated in the stylish and historic surroundings of the 17th century Hotel Convent de la Missió in the old town, a building which gives this restaurant a sense of calm, grace and charm that makes it a must-visit destination when you're visiting this fine city. 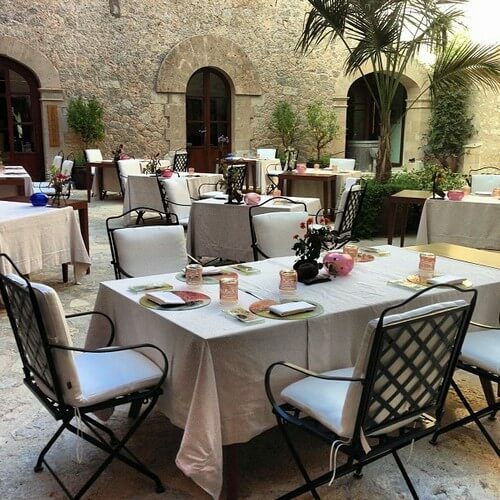 Housed in a fine historic building in the centre of Palma, this elegant restaurant has the added bonus of sharing its space with a contemporary art gallery, which is usually open during restaurant hours. The décor is simply fabulous; the floors are tiled with river rocks and the walls are covered with a forest-green material that creates a cool, natural vibe. There's a friendly bar where you can enjoy great cocktails before dinner – and the food is wonderful, particularly in its contemporary approach to traditional Spanish tapas. The staff are excellent; friendly, knowledgeable and fluent English-speaking – and they're only too pleased to tell you about ingredients, menus and judicious wine choices. 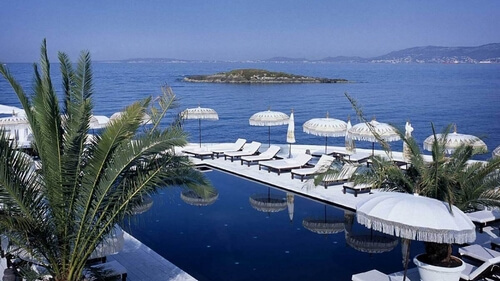 Mallorca's beaches and beach clubs are an irresistible magnet for all sorts of island visitors, from billionaires to bohemians, from fashionistas to fun-seekers and sun-seekers – so there's bound to be plenty of places to suit you from the following choice of hot beach-club destinations! 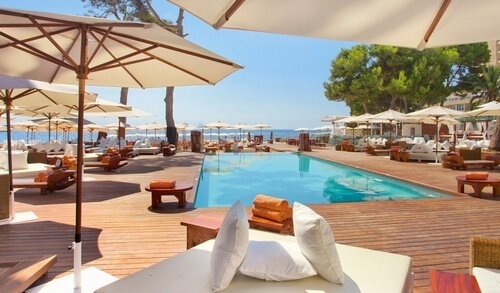 Nikki Beach is a byword for chilled beachside entertainment across the Mediterranean and beyond – a name that conjures up the coolest people with international lifestyles and an appetite for the exotic. 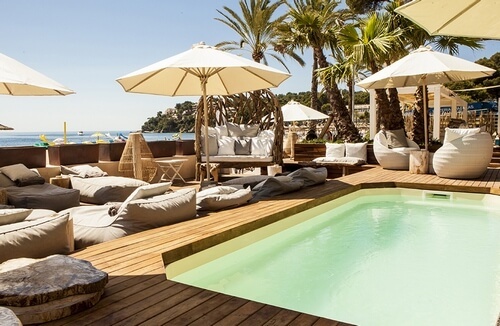 Nikki Beach Mallorca is no exception – and here you'll find the island's coolest people (wearing the hottest fashions) relaxing on oversized sunbeds, chugging champagne and dancing day and night to some of the world's best DJs and live entertainment. 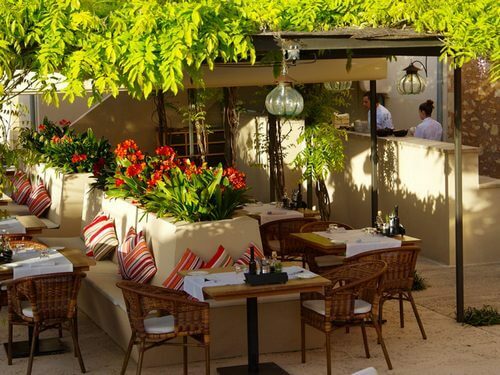 You can wine, dine and relax in sumptuous surroundings overlooking a fabulous white-sand beach that's only 20 minutes from Palma – plus there's a great swimming pool, indoor and outdoor dining and a private beach area for VIP guests. You can also enjoy beauty treatments and complimentary ship-to-shore pick-up service if you happen to be arriving on a yacht. 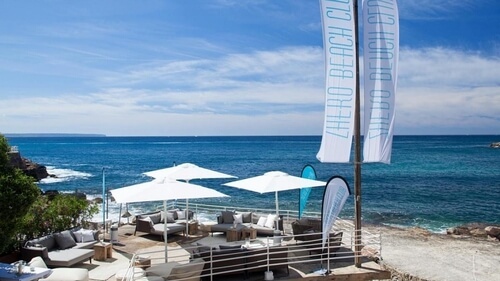 This irresistible beach club is ideally located in one of the best locations on Palma's boardwalk – the island’s favourite places for promenading by day and night. Tailor-made for watching Mallorca’s spectacular sunsets, you can enjoy this daily free spectacle from the club’s pool or from a table at its fabulous restaurant. Anima specialises in exceptionally popular evening beach parties – and the club’s sophisticated lighting and sound system make the whole environment a magic kingdom when the sun goes down. They have an impressive champagne menu – and try out their gorgeous Cava sangria, for a refreshing pre-dinner drink. Naturally, they’ve got a fabulous food menu as well – with special emphasis on freshly caught seafood. If dreaming your time away and gazing out to sea with a chilled cocktail is your idea of heaven, then that blissful state awaits you at this cosmopolitan beach club located in the beautiful environs of Illetas beach resort. 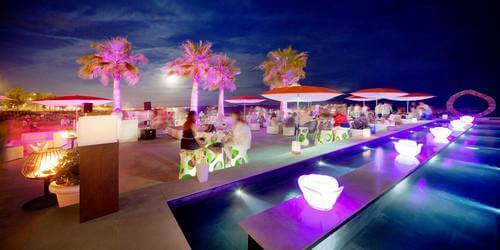 There's a large terrace overlooking the ocean, and their sun loungers and day beds are uber-comfortable and inviting. You can walk straight down to the beach and the sea from the club – and entertainment is plentiful, including star DJs who skilfully match the music to the time of day and the mood of the guests. Enjoy an excellent meal at the international restaurant, plus you'll be welcome at the highly sociable terrace bar where you can meet your fellow guests. There are a number of club zones, each with its own distinct vibe, décor, ambience and music - all with panoramic views of the Mediterranean and Palma Bay. Even decadence can be healthy – especially when you enjoy the healthy, tasty food at Zhero, accompanied by a delicious side order of relaxing Lounge music, a private pool and Balinese day beds! Just a short distance from Palma, Zhero’s well-being menu includes some brilliant sushi, crisp salads, premium burgers, plus specially selected Mallorcan wines, the best chilled Cava, champagne and some truly original cocktails. Zhero overlooks the lovely rocky inlet of San Agustin, whose beach provides safe bathing waters – all on view from the large teak-built terrace. To complement your healthy meals, you can benefit from the in-house therapists, who provide world-class massages, and there are also yoga lessons plus many other distractions – not least the fact that sun loungers come with towels, fruit, a champagne glass, a smoothie and wet towels. Better still, if you book a Balinese day bed, you’ll also get a whole bottle of champagne bottle and chilled San Pellegrino water! This is a real getaway place to get away to, with a deliciously peaceful atmosphere far from the crowds. Better still, it’s located on a drop-dead-gorgeous stretch of coastline that is emphatically and absolutely traditional Mallorcan in style. There’s a cool pool, a welcoming bar and a very attractive restaurant – a trio of essentials that add up to having a particularly good time here, especially when you add the views of ocean, rugged rocks and cliffs. Choose your favourite seating and chill-out area from several on offer – and enjoy a relaxed atmosphere of drowsy, drifting conversations, mellow music, and simply enjoying the perfection of the moment - you’ll find it hard to beat anywhere else on the island of Mallorca! Puro Beach Club is an all-day, all-evening destination that cossets you from the moment you arrive at its to-die-for oceanfront location. Start your day with a yoga class to calm and stimulate mind and body – or maybe you'd prefer a meditation lesson or spa treatment, followed by a delicious breakfast. Lunchtime cocktails and light lunches are followed by mellow afternoon tunes spun by DJs on the decks, playing all the best tunes from around the world. By the evening, it's definitely party-time with sunset drinks and sounds to waft you into velvet night beneath the stars, when the action really gets going. Located on its own small peninsula, Purobeach Beach Club is deliciously embraced by the sea, with 180-degree ocean views, and spectacular sunsets over the island's spectacular mountains. Purobeach is close to Palma city centre – but it feels like you're a million miles from anywhere when you're chilling out there and enjoying the coolest ambience in Mallorca! Boho chic and brilliant surroundings create a truly unique atmosphere at this elegant, barefoot luxury beach club centred round an inviting pool with plenty of sun loungers. The club's outdoor restaurant is a real find, with friendly staff, a fabulous menu, hard-to-find wines – plus it serves up fresh Mediterranean cuisine and some of the best salads on the island. Situated right on the beach in Magaluf, the club has been tastefully decorated with suffused and muted tones, which provide the perfect chilled backdrop to the main action created by top DJs who know just how to chill you out, warm you up – or get you hot and happy to some of the newest dance tunes from top international dance-clubs. This fabulous and celebrated beach club is located right on the sea-front, and boasts an urban lifestyle vibe that draws in the faithful from all over the island. Constantly re-inventing itself with imagination and verve, it stages art exhibitions, puts on live music, holds parties and special events (especially for Hallowe'en, Christmas and Mardi Gras Carnival) – and all this action keeps people coming back for more time and again. 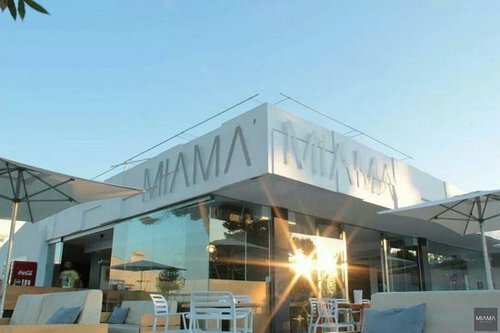 There's a particularly impressive cocktail menu, and they serve superb home-prepared food as well – and if you like good dance music and chill-out tunes, this is the place to tap in to the very latest music from the clubbing universe, courtesy of top DJs who seriously know their stuff. As an added bonus, they offer free Wi-Fi, and they'll be more than happy to organise your very own private party or event. 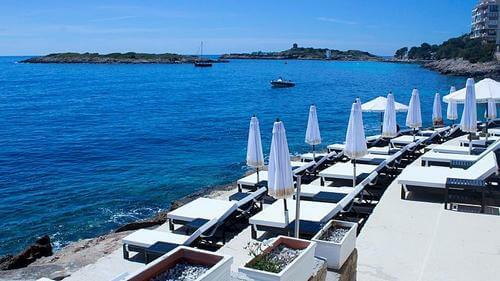 This beach club is no more than a quick journey of ten minutes from central Palma, and it's renowned throughout the island, thanks to its superb location overlooking a small, perfect sandy beach embraced by a protective rocky cove. Both its bar and restaurant share this gorgeous view – and the latter is adept at magically conjuring up fine food at any time of the day. Sunrise and breakfast here go together perfectly, light lunches of salads or paella are just the thing for the middle of the day – and the evening menu is truly outstanding. The club has an impressive range of amenities, including a chill-out space, wellness centre and parking area; they also provide hammocks, parasols, pedal boats and kayaks – plus there are changing rooms and showers as well. Las Terrazas is great at organising private events, and comes highly recommended if you're planning a wedding, birthday party, or a family event. At this beach club, the beach is truly the star, with a long golden strand dotted with plenty of beach umbrellas and sun loungers. Easy-going, relaxed and unpretentious, everyone's welcome here – and whilst this is definitely a club that the locals favour, the staff look after all their guests with unrivalled panache and friendliness. If you love that great Spanish dish, paella, this is the place to enjoy one of the best on the island, as well as plenty of other traditional Mallorcan and Mediterranean dishes. They serve up a mean mojito as well, which always goes down well when the sun goes down – and makes a refreshing accompaniment to dancing, which you're invited to enjoy with abandon and enthusiasm. They have a regular programme of evening live music events, as well as DJs every Saturday from 5pm to 10pm. If you are feeling hungry after reading this page visit here for more on the places to eat at in Mallorca! By submitting this form I give my consent to Unique Luxury Holidays to be in touch with me via email using the information I have provided in this form for the purpose of news, updates and marketing.